Stewart Copeland writes about his life in new book, "Strange Things Happen"
(CNN) -- Stewart Copeland and Sting get along great. Really. 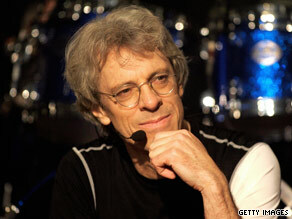 Stewart Copeland's background includes a wide range of musical influences, many of which emerged in the Police. OK, the Police's drummer and bassist may have argued from time to time. Perhaps even ferociously. And Copeland finds Sting's attempts to be a drum arranger annoying. OK, maybe infuriating. But, as he writes in his new book, "Strange Things Happen" (HarperStudio), "We have discovered that we can be good friends -- as long as no one mentions music." Copeland may be best known for the hitmaking musical trio, but he hasn't let the Police define him. Copeland took some time to talk about his relationship with the Police, the importance of percussion and the social niceties of West L.A. private schools. The following is an edited version of the interview. CNN: The pace of the book makes it seem like you've been living "A Hard Day's Night" for the last 30 or 35 years. Is it really that busy? Stewart Copeland: Oh, it's pretty busy, but if it wasn't busy, I'd be stressed and anxious. In fact, this week I've got some down time, and I'm looking at the walls. CNN: It's been inescapable that people are focusing on the part of the book involving you and your fellow Police members. You say that you have a great relationship with Sting until music gets involved. Copeland: We get along in every way until it comes to music. ... [But] both of them are crap at drums, so at least I don't have that to deal with. CNN: So Sting is not much of a drummer, despite the fact that he has all these ideas. Copeland: Actually, he can play a bit of drums, but he's much better arranging drums than playing them. And I think I'd rather have him as a drummer than as an arranger of drums, even though he's quite brilliant at [arranging]. CNN: Has there always been that friction in the band? Copeland: Yes. With Andy, there's no friction at all; we get along great. ... And by the way, he's not the man in the middle, either. He's not a mediator. He's his own little volcano. He's a very sharp point to the triangle. But this conflict ... when we did the reunion tour, it was like everything was different, but nothing had changed. From the first 16 bars, we were straight back into where we left off. CNN: With the Police, the friction seems -- for lack of a better term -- healthy. Copeland: Well, it's that musical dichotomy that makes the band what it is. If we didn't have those beautiful, sensitive songs, we'd be lost. Those beautiful, sensitive songs have an extra kick to them because there's a madman in the group. CNN: Does the madman change, or is it always Sting? Copeland: Actually, all three of us have our moments. CNN: You grew up in the Middle East. Do you see any reflections of that in the way you play the drums, in the way you feel the beat? Copeland: Absolutely. I grew up surrounded by Arabic music. The central element of Arabic music is the baladi rhythm, which is just Arabic for "country." And it has that drop on the three-beat. And it has that use of negative space. And it also has the very ornate use of the 16th notes, which are very expressive in Arabic music. And I suppose those are all factors that show up in the Police. CNN: You mentioned in the book that you put aside the sticks for many years until [Primus'] Les Claypool got you back into it. Copeland: Yes. The Police experience in the studio was so horrendous that my two colleagues actually managed temporarily to convince me that I had no talent and I was a menace to music. And I was distracted by composing. ... I wanted to play with all of those toys, and needed to shake off the rhythm label. And I think I was successful in doing that, to the detriment of my drumming career. CNN: Was picking up the sticks again like riding a bike? Copeland: Absolutely. The rhythm is still there. The pulse is still strong. The persnickety bits -- the finesse -- that took awhile to come back. CNN: You mention getting together with all-star bands with others -- Gene Simmons, Stephen Stills -- at your son's school. Is that common in L.A.? Copeland: Well, in Los Angeles in the west side here, there are three or four schools where all the alpha types send their kids. Between the three schools, we have all of the glitterati. CNN: Do you still find yourself a fan in those situations, seeing musicians you admire? And also at these schools, everything is extremely downplayed. All of these alpha wives of these luminaries -- and the female luminaries themselves -- all go down to Gap especially to buy their school clothes. No bling, Gap clothing. It's all extremely dressed down and un-ostentatious. CNN: Is there a favorite or least favorite Police song you do? Do you get so that you think, "If I have to play 'Roxanne' one more time ... "
Copeland: No, I still enjoy playing "Roxanne." ... Some songs are more of a mountain to climb physically, [like] "When the World Is Running Down." Andy takes a guitar solo that is so stratospheric, climbs so high and has such power, I get carried away. By the time he's finished, I am done. And I realize that I've just burnt every calorie, and I've got another 45 minutes of set to play. CNN: People don't realize how physically demanding it is. Copeland: But the thing is, when you're doing it, you're hardly aware of it as well, because you're sustained by 80,000 people freaking out. ... I don't want to get all metaphysical here or nothin', but something definitely happens. You are definitely empowered by the power of that huge audience. ... It pumps you up.